This baby has difficulty lifting her hand. When she tries, she turns on all her muscles causing her hand to fist, the elbow to flex and the shoulder to lift up. This sets off a chain reaction that stiffens her entire leg. When I show this photo to therapists or physicians, I ask, “What is the diagnosis?” In most cases they say right-sided hemiplegia, as a child with a hemiplegia adopts the same posture when they try to lift the hand to the mouth. In this situation, the baby develops activity dependent tone when trying to get a damaged nervous system to work. 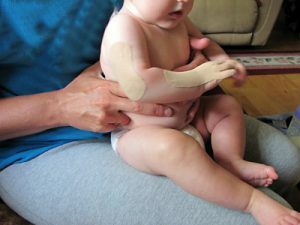 Simple support, in this case Kinesiotape, to assist alignment, allows the infant to see and explore the hand.